Front: Lifted coil springs, lower control arms, sway bar links, and crossmember spacers. Rear: Lower control arms and track bar bracket (factory front coils are used to lift the rear). 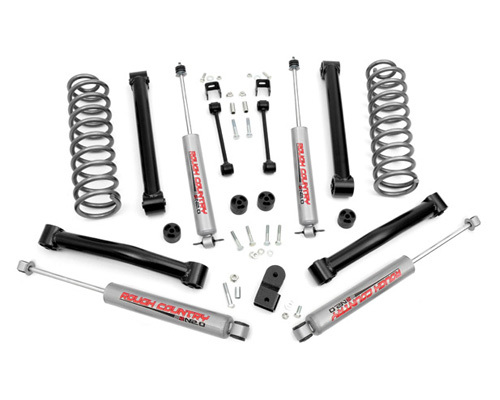 Shocks: (4) Premium N2.0 series nitro shocks. Features application valved N2.0 series shocks which offer the best in balanced performance for on and off-road use. V-8 models includes front 0.75" coil spacers. Stock front coil springs are moved to lift the rear.